(PRLEAP.COM) Los Angeles, CA – The latest styles of women's handbags have arrived and are now available wholesale at PrimeTime Clothing. Store owners will find an excellent selection of styles, colors and textures that are perfect for fall. Fall handbags now available at PrimeTime Clothing include clutches, satchels, cross-body, shoulder bags, totes and much more. With PrimeTime Clothing, wholesale shoppers can enjoy the latest trends and some of the most competitive pricing on fall handbags without sacrificing quality. Clients will also find the latest fall handbags from designers like Calvin Klein and Bebe. These quality accessories are the perfect addition to any fall outfit and will be a popular item this season. Store owners can order a variety of styles in small lots to meet the different needs and personal styles of their clients. This fall's handbag styles feature bold colors like red and orange in great textures and designs and PrimeTime Clothing has these latest looks available. Timeless colors such as black and burgundy are always in style and PrimeTime Clothing also has great selections of these popular handbags that can be worn in the fall and all year long. Clients can also enjoy free shipping on orders over $300 anywhere in the Continental U.S and 15 percent off the first order. 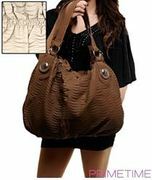 To shop the fall collection of women's handbags, visit www.primetimeclothing.com. PrimeTime Clothing offers the best selection of premium wholesale fashion apparel and accessories at the lowest discounted prices. Our highest quality goods arrive daily from hundreds of Los Angeles area manufacturers and importers. We have over 25 years of experience in the business of discounted wholesale apparel and we know exactly how to satisfy your clothing desires. Our mission is to constantly provide our customers with the latest fashionable Junior, Missy, Plus-Size, Men's, Active Wear, Intimate, Handbags, Accessories and much more for the absolute lowest prices.